The East Harris County Manufacturers Association (EHCMA) is a voluntary organisation of more than 130 companies that operate refineries and production facilities in the Houston Ship Channel. 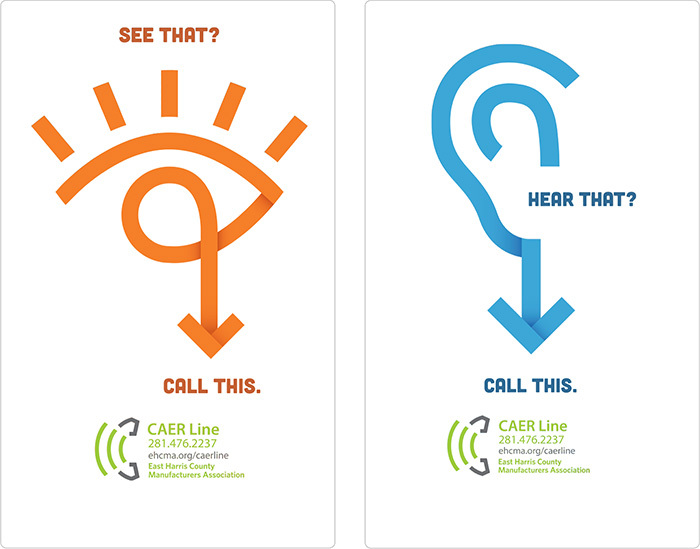 In 1986, EHCMA created a hotline called the Community Awareness and Emergency Response (CAER) Line. The hotline is a resource for community members and industry stakeholders to gather information about industrial events, which may include unpleasant or unusual sights, smells and sounds. After more than 20 years with little change, the CAER Line faced several challenges and the organisation’s leadership decided to invest in a revitalised CAER Line system with upgraded capabilities and a refreshed brand. So they called on us to launch the new hotline. During the course of a year, Fifth Ring created a strategic communications campaign that not only positioned the new CAER Line, but also kept EHCMA members abreast of developments and key attributes of the new system. Once the hotline was ready for launch, Fifth Ring also secured articles in community newspapers and other key publications. While Fifth Ring was originally tasked to launch the CAER Line, we have gone on to develop a deeper relationship with EHCMA as a strategic public relations advisor. Through targeted community engagement, proactive media relations and a strategic internal and external communications programme, Fifth Ring has raised the profile of the organisation as a valuable asset for community members and the industry. We now work with EHCMA in a greater capacity that involves management of a quarterly newsletter and creation of a new website.